Has anyone done this to their house? I would think it would have to be really dark and windows covered. I have seen a site that sells different display projections but its pricy. Check out this video by Jordan Nash on how to do it. Just getting back on the forums after a long break away. 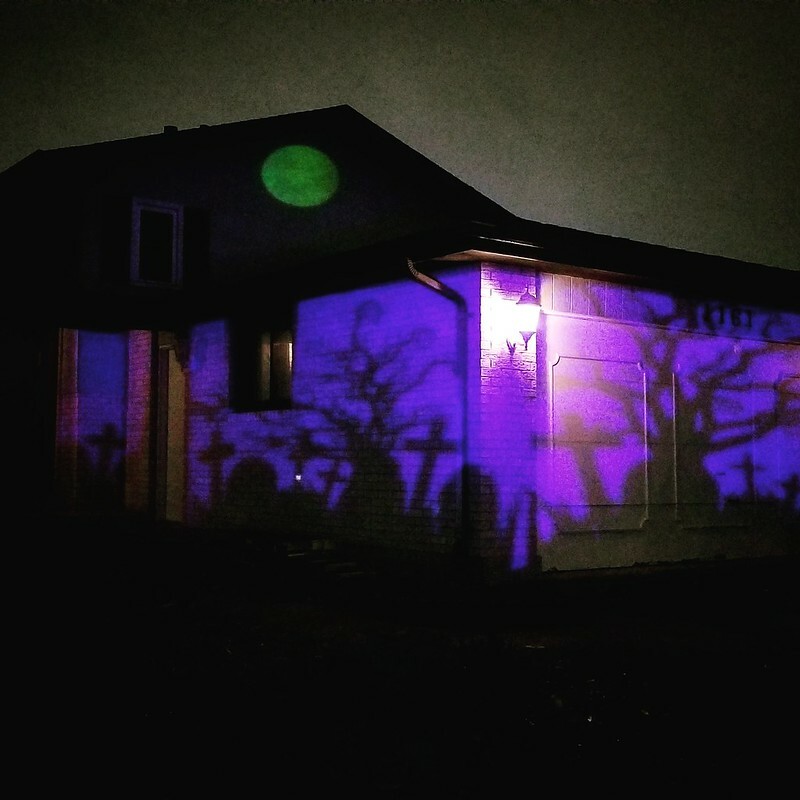 I'm doing video projection for Halloween and Christmas. This is my second year of doing projection plus another year or two of failed experimenting. This year, I cut back on traditional Christmas lights quite a bit and focused on the projection. For next year, I'll go back to doing both. Traditional lights will grab people's attention (unless your projection is REALLY bright--like commercial quality bright with commercial quality prices), but the projection animation will make it unique. The videos below were made when I used one 2000 lumen projector. We have moderate light pollution--lots of street lights, neighbors houses with security lighting--but I think the projection shows up well. Even with the bright sconce lights on my garage, the single 2000 lumen projector shows up nice (see the halloween picture). I replaced the bright lights with dim candle flicking lights which helps a lot (see the Christmas videos). Click on the Christmas pictures to see a the video. 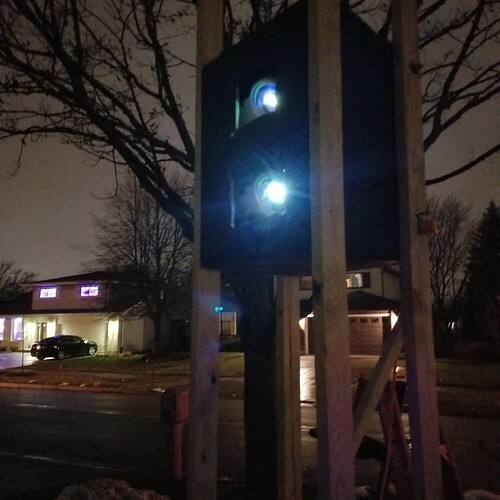 looks great when you can afford a projector with enough lumens $$$$$$. I would love to know what the size of those projectors that Disney uses. 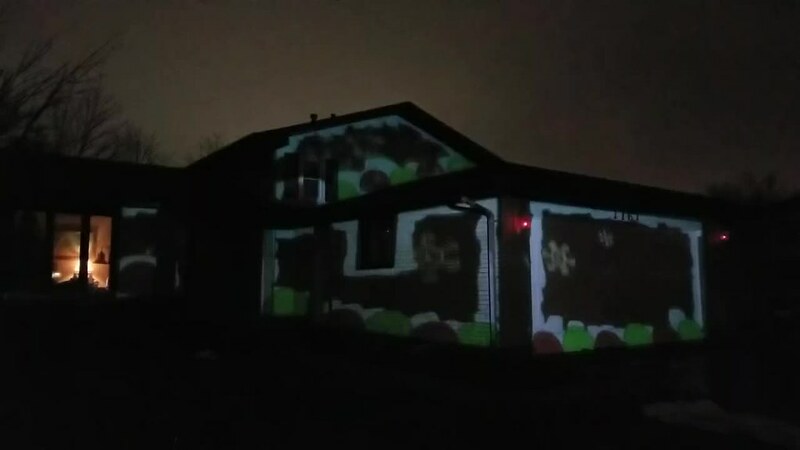 I do projection on elements of the house. Dining room window has rear projection virtual Santa for 6-7 years now. And then I have my Coro projection snowglobe. With the 6' snow globe I have a 3000 lumen short throw projector less than 5' away and even with that I get a good amount of wash out from the lights on the house. IMO the length of the throw is more important as the # of lumens. I love your snowglobe. 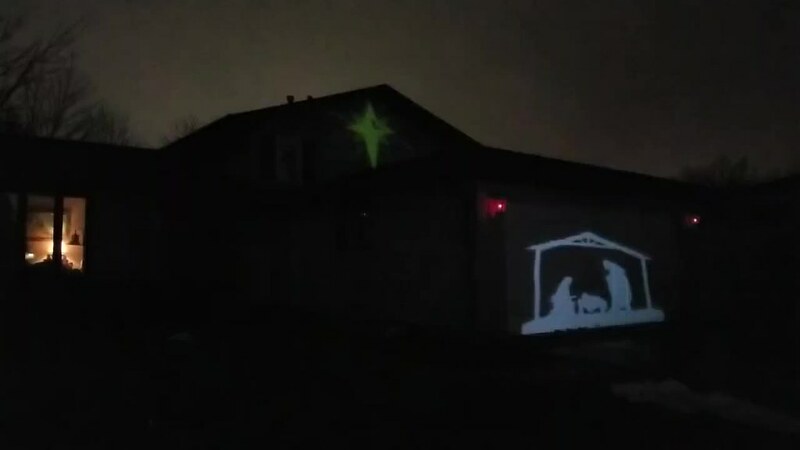 I've been thinking of adding something almost exactly like what you have since I started doing Christmas projections. If you have videos of it, and are willing to share, please post! I'm headed to Disney World in a couple of weeks, I'll see if I can find someone that can give me details about the projectors they use :-) Last time I was there I counted 16 projectors; 4 different angles, with 4 projectors each (which doesn't sound like a lot -- but are probably 50-100k lumen each). The Merchandise Mart in Chicago just installed a permanent projection system. I'm sure it's close to as large of an area as Cinderella's Castle. They use a total of 34 projectors, 30k lumens each, at a street price of about $70k each. I'm up to two projectors stacked, 2000 lumens each!